It is important that a believer understands the concept and benefits of prayer, otherwise prayer can simply become ‘uttering words’. Prayer in its simplest form is talking and listening to God; connecting Spirit to spirit. When we call to God, He promises to answer and show us the great and hidden things of heaven (Jeremiah 33:3). Therefore, everyday prayer is necessary for believers because God’s Word teaches us that we must ‘prayer without ceasing’ (1 Thessalonians 5:17). Daily prayer cultivates a deep meaningful and personal relationship with God. Daily prayer provides many benefits to those of the Christian Faith. Everyday prayer is important because it moves us to a life of extended faith. It is through daily prayer that anxiety and stress is released. Daily prayer helps us develop an attitude of forgiveness of others as well as confessing and seeking forgiveness of our own sins. Without daily prayer, we are susceptible to the schemes and wiles of the enemy. Our everyday prayer enables our spiritual battery to become fully charged. Through daily prayer our inner man is renewed through Jesus, which is an important and key benefit in the disciplines of everyday prayer. The Greek Word proseuche (Strong’s 4335) means to offer prayer addressed to God. Also, prayers can often require us to intercede on behalf of others; the Hebrew word ‘Palal’ (Strong’s 6419) means to intercede or make supplication. It is God’s desire that we seek His face on a daily basis. 1. 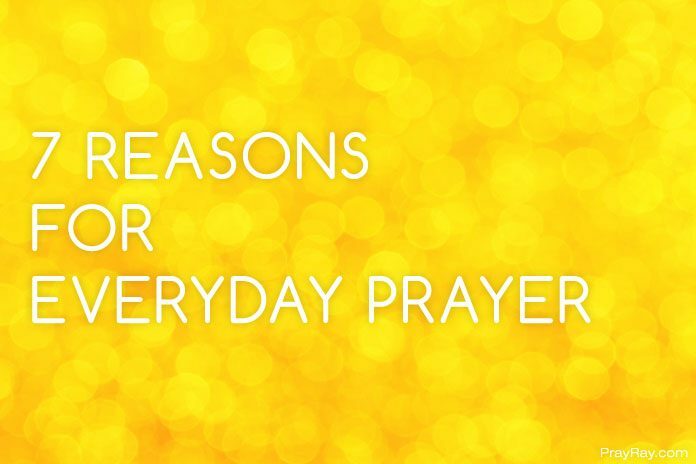 Daily prayer provides many benefits to those of the Christian Faith. God’s Word informs of why we should seek His face through prayer. If we “ask, and it will be given to you; seek, and you will find; knock, and it will be opened to you. For everyone who asks receives, and he who seeks finds, and to him who knocks it will be opened” (Matthew 7:7-8). Therefore, through everyday prayer, we begin to apply the three realms of prayer to our personal lives (asking, seeking and knocking realm). We can ask our Heavenly Father for something and have the assurance that He will answer. However, there are times when our prayers require more than just asking. Sometimes, the answers to our prayers only come through seeking after God and knocking until the door is opened. 2. Everyday prayer is important because it moves us to a life of extended faith. Daily prayer gives us direct communication with God and as we develop our relationship with Him and experience His response to our prayers, our faith becomes renewed. It is the prayer of faith that will move the mountains in our lives; “if you have faith as a mustard seed, you will say to this mountain, ‘Move from here to there,’ and it will move; and nothing will be impossible for you” (Matthew 17:20). 3. It is through daily prayer that anxiety and stress is released. That is why God’s Word reminds us to “…Cast all your care upon Him, for He cares for you” (1 Peter 5:7). Daily prayer helps us bring our concerns, thoughts and anxieties to Him and is important because it gives us the direct access to share our heart with God, our refuge who comforts us in the midst of adversity (Psalm 46:1). It is through everyday prayer that we can petition God, with thanksgiving, presenting our requests to Him” (Philippians 4:6). Not only does everyday prayer enable us to cast our cares on Him, but we also receive ‘the peace of God, which transcends all understanding, thus guarding our hearts and minds in Christ Jesus” (Philippians 4:7). 4. Daily prayer also helps us develop an attitude of forgiveness of others as well as confessing and seeking forgiveness of our own sins. “If we confess our sins, He is faithful and just to forgive us oursins and to cleanse us from all unrighteousness” (1 John 1:9). Consistent and regular praying restores us back to Our Father and to those who we may have a grievance with. It is through prayer and the Holy Spirit convicting us, we are able to find the power through Jesus Christ to walk in the spirit of forgiveness. Everyday prayer is important because it helps us to “love our enemies, bless those who curse you, do good to those who hate you, and pray for those who spitefully use you and persecute you” (Matthew 5:44). 5. Without daily prayer, we are susceptible to the schemes and wiles of the enemy. Therefore, daily prayer gives us the supernatural strength and power to avoid temptation as instructed by God’s Word; “watch and pray so that you will not fall into temptation”. Without daily prayer, the flesh overtakes the spirit. Therefore, we must pray asking God to guide and direct us from our sinful desires; Our prayers, should be centred around dispelling the yielding of temptation over our lives; “And do not lead us into temptation, butdeliver us from the evil one; For Yours is the kingdom and the power and the glory forever. Amen” (Matthew 6:13). 6. Our everyday prayer enables our spiritual battery to become fully charged. This is important because, when we are spiritually charged by the Holy Spirit, we can discern the things of darkness. Acts 16:16-18 is a prime example when Paul was able to discern the evil spirit of the female slave who predicted the future, earning lots of money for her owners by fortune-telling. Paul’s spiritual battery was fully charged and the Spirit enabled him to speak to the spirit within her (v18). Paul spoke (prayed) to God, in the name of Jesus Christ that the spirit would come out of her. Immediately the spirit left her. Our spiritual battery remains fully charged, through a life of daily prayer, reading of His Word and fasting. 7. Finally, through everyday prayer our inner man is renewed through Jesus Christ, which is an important and key benefit in the disciplines of daily prayer. 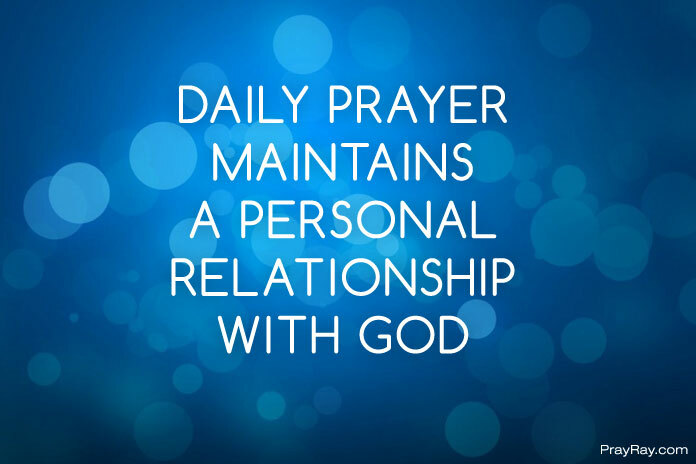 For our inner man to remain renewed, daily communication with God through prayer is paramount. “Therefore, we do not lose heart, but though our outer man is decaying, yet our inner man is being renewed day by day” (2 Corinthians 4:16). Father, we thank You for Your Word that teaches us how to pray. We come before you, seeking the leading of Your Holy Spirit and ask that You will stir up in us a hunger for daily praying. Father, we ask that daily prayer will become the heart beat of every believer; daily prayer will become more important than our ‘to do list’; daily prayer will remain at the forefront of our minds. Let our daily prayers counteract the forces of darkness and the ‘god of this age’; this we ask in Jesus Name, Amen.